Ceramic/Tile: Some pipes are made of ceramic or Clay Tile. This type of piping is inexpensive, but only useable in low-pressure applications such as drainage. Lead: Lead is a toxic metal linked to neurological disorders, so lead pipes should be replaced as soon as possible. They are common in old homes, built before safety regulations preventing their legal use in homes. This type of piping was mainly used for potable water lines. Steel: Steel was chosen for pipes in the middle of the 20th Steel pipes replaced lead pipes for safety reasons. Steel exposed to water eventually rusts and is also very, very heavy, making the pipes unwieldy. Steel is still used in some applications today. Copper: Copper pipes are the standard for metal pipes in homes, being lightweight, non-toxic, and they do not rust. However, copper piping is expensive and can corrode over time. Copper can be used in a wide variety of applications, but is more commonly used for potable water. Copper pipes can also handle hot and pressurized water more easily than other types. PVC: PVC is a common option for piping because it is durable and lightweight. It is also easier to install than other types, does not rust or corrode like some metal pipes do, and is non-toxic. PVC is used for drainage more often than potable water, but can be used for both. Pex: PEX pipe is made from cross-linked HDPE (high density polyethylene). This pipe is suitable for a variety of potable plumbing applications. It is a new type of piping that is being installed more often due to its ease of use and durability. Pex pipe is cost efficient, however, the fittings and tools needed to connect it are not. This type of pipe is also not approved for outdoor applications because of continuous UV exposure. 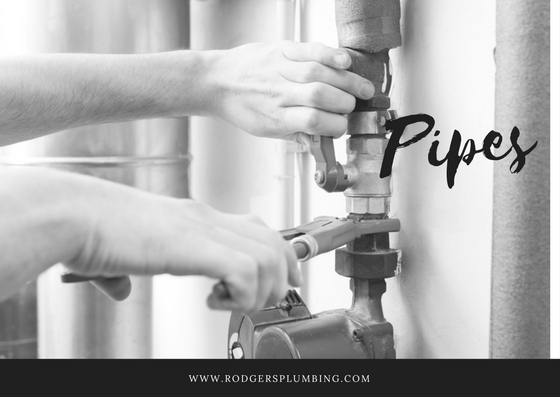 If your copper pipes have a leak, or you think your old steel pipes need to be replaced, call Rodger’s Plumbing at (972) 931-1021! We’ll help fix any plumbing problems that may arise in your home.